This is my curated list of top landscape photography courses that are available in an online or digital platform. Most of what I know from photography has been self-taught, and I thought I was covering all the basics. However it turns out that there are professional photographers out there who are incredibly smart, and who are really good at communicating these sometimes technical skills that are required to take your photography game to the next level. Below are what I consider to be the ultimate landscape photography courses. I hope you get as much out of them as I have. Check out our other blog post if you're looking for different types of online photography classes. This course is great, and it strays from the usual type of course that I would recommend here. Professional outdoor photographer Marc Muench discusses in the perfect level of detail what it takes to successfully create incredible landscape images. That is what makes this an ultimate landscape photography course. I am a huge fan of helpful and realistic information that enables me to make the decisions necessary to progress, exceed, and excel at taking photos in an entirely different way. 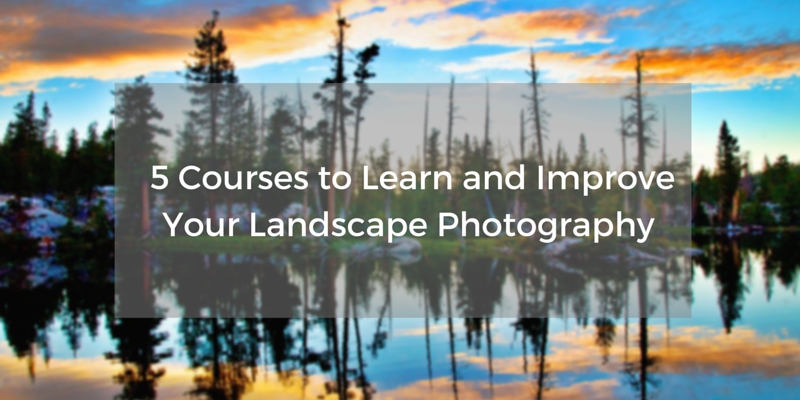 This is the course that has all the information about what makes a professional landscape photographer truly a pro. Chris Burkard is one of my all-time favorite photographers. His landscape and adventure images are simply stunning. Therefore any opportunity to learn from his is unique style and techniques is simply too good to miss out on. In this ultimate course, Chris covers everything, from gear, to setup and process. From taking the picture itself, to post-processing and then promoting the image via social-media. Here are his secrets, revealed. It was pretty great to learn all about this amazing photographer's entire process, both for how he opperates his camera, and his business. Chris has garnered a lot of well-deserved success, and it is really nice to hear him explain what it takes to get there. Expanding on lessons learned from his course, I put together this helpful guide of landscape photography tips for beginners. In this incredible on-location course, professional outdoor photographer Ian Shive guides you through some of the most scenic locations for landscape photography in the world: America's national parks. He shows you how to capture images that are both emotionally and technically engaging, by demonstrating the techniques that produce the results that most accurately reflect how amazing these scenic locations actually are. If you have ever traveled to national park (or anywhere beautiful for that matter), and have been disappointed with how your images do not reflect what it was like to actually be there, then this course will make you very happy. I found Ian's explanations of why certain techniques and equipment make a difference, to be very easy to digest, and even enjoyable. I have been shooting night photography for a years, but most of what I have learned has been through trial and error. Nowhere on the web have all these details been available in one place, until now. In this course that is more beginner-oriented, pro photographer Matt Kloskowski guides you through all the things that you need to consider when taking a landscape photo, from start to finish. Everything from the gear you need, to factors to look for on-location, to settings, and then to post-processing. Matt Kloskowski is one of my favorite landscape photography instructors because he is just so relatable, and is able to convey complex technical information in a really informal, digestible way. I was able to participate in this course, both in the on-location content, and in the promo video featured here. Highly recommend. Professional photographer Matt Kloskowski is at CreativeLive to dive into the perfect level of detail for post-processing your landscape and outdoor photographs. As he explains, the thing about landscape photography is that the camera is not there to capture exactly what you saw/felt when you were there, it is only able to bring in all the necessary exposure data. It is up to the photorapher to understand how to bring that image to life after the fact, to make it reflect what the scene truly felt like. This isn't an "intro to Lightroom basics" course (although CreativeLive offers a few great lightroom courses like that too), it is a finely-tuned and extremely helpful look at some of the most useful tools in the Adobe Lightroom and Photoshop CC arsenal, specific to landscape photography. I personally love to take a lot of blurred waterfall photos, and Matt's description and walk-through for how to post-process these types of landscapes is expertly taught. Stuck In Customs also has a really great course on HDR photography, where you can learn to use this popular skill for adding either realistic dynamic range, or an artistic look and feel to your photos. The choice is yours.